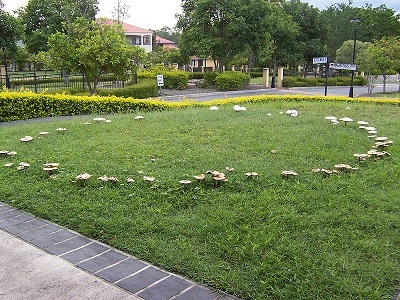 Mushroom ring produced at the conclusion of an SCP-3353 event. 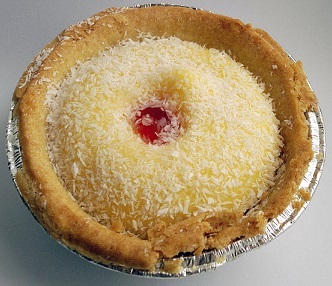 Manchester tart produced by SCP-3353. Special Containment Procedures: Foundation historians specializing in European folklore are to maintain a list of numerically-significant dates to predict future SCP-3353 manifestations. Locations that have been confirmed affected by SCP-3353 manifestations are to be investigated at least twice monthly, as per dates noted on the predictive list. Should SCP-3353 manifest during a monitoring session, Foundation agents are to patrol the area and intercept any passersby who approach the location of manifestation too closely. Amnestics may be administered as necessary. A disinformation team of at least ten researchers is to monitor social media outlets for reports of SCP-3353 sightings. SCP-3353 is to be explained as a low-attention public artistic project involving fairy tale enthusiasts attempting to “make people’s lives a little more magical!” To aid with this cover story, five SCP-3353 disinformation team members are to maintain several active artistic blog accounts, which regularly post a variety of mundane art content in addition to recipes and crafts instructions for making non-anomalous versions of the apples and desserts produced by SCP-3353. Apples recovered from SCP-3353 events are to be kept for analysis in low-priority storage. Should the apples spoil, they can be disposed of in non-anomalous waste containers. Following the appearance of the apple tree, several apples will manifest beneath it. These apples appear non-anomalous, with the exception of not displaying on digital device screens when photographed or videotaped. Closer inspection will reveal the words “Tell me a secret” etched in neat handwriting into the skin of the apples, as if carved with a small knife. Should a human individual voice a personal statement while holding an apple produced by SCP-3353, there is a chance that the apple will vanish and be replaced by a small dessert (biscuits, tarts, or small cakes). Desserts produced through this effect are universally enjoyed by any individuals who consume them, regardless of existing taste preferences, and appear otherwise non-anomalous. It is further noted that SCP-3353 desserts tend to spoil at a quicker rate than non-anomalous counterparts. In rare cases, individuals who handle an apple produced by SCP-3353 but attempt to hide it on their person or otherwise refuse to speak to it will grow drowsy, eventually falling into a deep sleep for several hours. This effect seems to result in extreme disorientation upon awakening, but no lasting harm. Apples that were not handled during the SCP-3353 manifestation will revert to non-anomalous variants (with no etching) at the conclusion of the event. At the conclusion of the SCP-3353 manifestation, the apple tree will be replaced with a ring of mushrooms2. The mushrooms produced are consistently local species and possess no anomalous qualities. Addendum SCP-3353-1: The first recorded case of SCP-3353 manifestation occurred on 03/23/2013, when two Foundation personnel patrolling a privately-owned park during their routine duties noticed the unusual apple tree associated with the presence of SCP-3353. The personnel approached the tree, noting that both it and the surrounding apples on the ground did not display on the surveillance cameras. “I tell my mother that I like her cooking, but I really don’t.” No change noted. “I’m embarrassed by not knowing the difference between vegan and vegetarian, even though my girlfriend is vegetarian.” Apple cracked in half, and transformed into a small cupcake. “When I was younger I smashed my friend’s toy car, because I secretly wanted them to pay more attention to me.” No change noted. “If I can get away with it, I won’t bathe for a few days in a row or I’ll only wash my body and not my hair because it feels like a chore and unnecessary too.” No change noted. “One time I mispronounced a word and people laughed at me, so I went home and looked up lists of mispronounced words and practiced them.” Apple transformed into a Manchester tart. “I shave the hair on my knuckles every month.” No change noted. “I feel really awkward when I eat too slow or can't finish a meal in public, so I pretend that I like home cooking to eat alone as often as possible.” Apple transformed into a Manchester tart. Researcher Harris later reported that he felt that the exchange was "not a fair trade, all things considered" and that the anomaly itself seemed to be "more of a prank than anything else". The SCP-3353 research team is currently discussing how to assign personnel stationed in the United Kingdom for further investigation. 3. Researcher Harris has attested to the truthfulness of all recorded statements.